WHEN/WHERE: July 15-19th. Washington, DC area (Hilton Mark Center Hotel, Alexandria, VA). WHO ATTENDS: People who care about animals. WHAT: Presentations & workshops on topics such as animal abuse, veganism, population growth, and activism. Amazing, inspirational videos – including premieres. Eyewitness reports from Whale Wars and other key campaigns. WHY: To learn, network, get INSPIRED, share information & practices, and define new strategies for animal advocacy. MORE REASONS WHY: To CELEBRATE successes and to get motivated & encouraged to continue passionately advocating for the animals. EVEN MORE REASONS: 90 FREE exhibits featuring animal advocacy and social justice groups, compassionate shopping, delicious food, animal art, & more! Celebrity & activist awards. Networking receptions and a banquet. Fundraiser with exciting items such as vegan B&B package, vacations, & vegan artists’ creations. Something for your VEGAN TASTE BUDS: Of course the conference features all the best in vegan foods and products, donated by companies such as Turtle Mountain-SoDelicious, Turtle Island-Tofurky , Match Meats, Tofutti, Edwards & Sons ~ Chreese, Kiss My Face, LÄRABAR, Whole Foods, and more. COST: Registration fees vary based upon the number of days attending. Exhibits are FREE and open to the public Fri-Sun, 10:15 a.m. to 6 p.m.. Exhibit visitors receive a free pass to attend one daytime conference workshop. STILL NEED MORE INFO? For a program schedule, list of speakers, exhibitors, sponsors, and donors, promotional video, and previous conference footage, visit www.arconference.org. AR2010 is hosted by Farm Animal Rights Movement and co-sponsored by several animal advocacy groups, related businesses, and organizations.. For more information or to register for the conference, visit www.arconference.org or call 888-ASK-FARM. We thank you in advance for helping to promote the Animal Rights 2010 National Conference. We hope to see YOU there! When the simplest of designs works so well – it can be called ingenuity! These is one great little window bird feeder and it really fits that bill. First, the powder coat metal ensures many seasons of use and enjoyment. Complete with drainage hole, they’re the perfect size for feeding mealworms, fruit, suet, or seed mixes. Easily change up the menu according to season. Second, the extra large suction cup means this window feeder will stay stuck to windows. 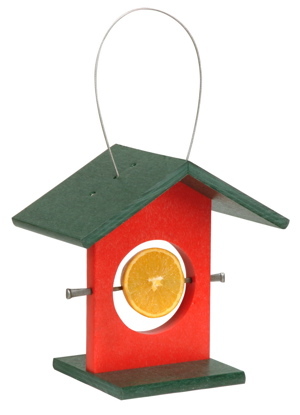 In vibrant colors, this fun little window bird feeder is not only versatile, but (reason three) the open design gives a great view of feathered friends too. Nothing in the way to obstruct your view of birds. Inexpensive, functional & fun; what more could you ask of any product? Small Yard? No Yard? No Problem! Even if your house has the smallest of yards, backyard birding shouldn’t be out of the question. Attracting songbirds does not need to be a complicated task requiring huge spaces. Window bird feeders are a great place to start. Once discovered, songbirds will return daily for treats you offer them. A myriad of these window feeders are available for birdseed, nectar, mealworms, and suet. These are some favorite foods of Chickadees, Nuthatches, Titmice, Cardinals, Hummingbirds, Orioles, Bluebirds and more. You can even offer fruit and any possible mixture with a window platform-type feeder. Blue Jays and Woodpeckers really go for peanuts on this one. Some window nectar feeders for hummingbirds feature removable lids for offering seed mixes in winter time. 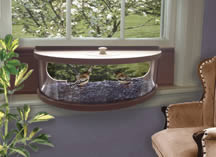 In-house window feeders will virtually bring birds right into your home! Aside from just attracting birds, window bird feeders offer fabulous views of your feathered friends. A great educational item for children as well, once you start the birding hobby…it’s addictive! Entice wild birds to your yard with feeders, houses, and a fresh water source. Small birdbaths will do a phenomenal job at attracting more species of birds to your place too. BLM Wild Horese Roundup…Here We Go Again! Washington, DC (June 22, 2010) – Today, the national law firm of Buchanan Ingersoll & Rooney P.C. (BIR) notified the U.S. Department of Justice that it intends to file suit over the Bureau of Land Management’s (BLM’s) proposed roundup and removal of 1,855 wild horses and 210 burros in the Twin Peaks Herd Management Area (HMA) located in Northeastern California. The letter was written after extensive public comments on the roundup (available here) were submitted to the BLM by In Defense of Animals (IDA), which also filed suit in federal court last November over the controversial roundup of nearly 2,000 wild horses from the Calico Mountains Complex in northwestern Nevada. Interior Secretary Ken Salazar’s recent appointment of BLM Director Bob Abbey to bring “reform” to the MMS exemplifies this connection. IDA has criticized the move, calling for President Obama to truly “clean house” by firing the “industry-cozy” Abbey and Salazar. Last week, IDA submitted extensive comments on the BLM’s Preliminary Environmental Assessment (EA) for the “Twin Peaks Herd Management Area Wild Horse and Burro Gather Plan.” IDA’s 20 pages of comments blast BLM’s population estimates and include BLM internal records and memos, BLM-funded studies and research plans, a photograph of a crippled wild horse taken by an ex-BLM horse specialist and other damning material demonstrating that the BLM’s proposed roundup is illegal and violates the mandates of the 1971 Wild and Free-Roaming Horses and Burros Act and the National Environmental Policy Act. The BLM intends to remove 80 percent of the horses living in the Twin Peaks HMA, in order to reach an Appropriate Management Level of just 448-785 wild horses and 72-116 burros on the 789,852 acre area. At the same time, BLM authorizes up to four times more cattle than wild horses in Twin Peaks and seven times more sheep than burros. The BLM roundup plans involve the use of helicopters to stampede horses for up to ten miles in the hot summer months – most foals will only be four to five months old. Of the horses rounded up and removed, family members will be separated for life and stallions will be castrated before being sent to long-term holding facilities in the Midwest. The roundup is scheduled to take place during the hot summer months of August and September 2010 – because mule deer hunters had complained that the “nuisance and noise” of the roundup would “dramatically reduce the quality of their hunting experience” in September and October – and is expected to take 45 to 60 days, costing American taxpayers millions of dollars. Wild horses comprise a small fraction of grazing animals on public lands, where they are outnumbered by livestock nearly 50 to 1. The BLM has recently increased cattle grazing allotments in areas where wild horses are being removed. Currently the BLM manages more than 256 million acres of public lands of which cattle grazing is allowed on 160 million acres; wild horses are only allowed on 26.6 million acres this land, which must be shared with cattle. The Obama Administration plans to remove nearly 12,000 wild horses and burros from public lands by October 2010. There are currently more than 36,000 wild horses warehoused in government holding facilities and only 33,000 wild horses free on the range. If you adore feathered friends and wild bird feeding but hate the ground mess, seed trays are definitely the answer. Many tube feeders come with attached trays, which also serve as perches for birds to eat. Some tube feeders are available with optional seed trays for a few dollars more, it’s a great investment! The problem is that some feeders offer none. Hopper style feeders can still make a pretty good ground mess with which to contend. What to do? The SeedHoop! These have gotten wonderful reviews by the many folks who use them. Sturdy, universal seed trays that give you total flexibility on where and how they’re used. In 16 and 30-inch sizes, Seed Hoops are versatile enough for hopper feeders and the larger size can even be pole mounted. The large platform area of these seed trays acts as an additional feeder for birds who may not use the feeder itself. You can expect to see some new visitors when adding these innovative and high quality seed trays. The most obvious reason for utilizing a seed tray is to eliminate ground waste. For us humanoids, it’s the unsightly mess and sprouting weeds that are annoying. For birds though, it’s really a health issue. Wasted seed tends to mold, it gets dirty with birds’ droppings and it attracts other critters who can transmit disease. Many avian diseases are airborne and spread rapidly affecting much of the local bird population if the mess or dirty feeders are left unattended for long stretches of time. This is why maintaining clean bird feeders is so important. Adding a seed tray will pretty much eliminate this problem. There are a bevy of models from which to choose, including pole-mounted and post mounted. 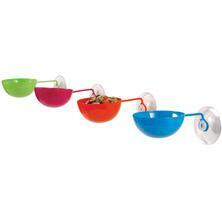 Hanging trays are used by attaching them to the feeder itself. The other advantage is that a seed tray will attract more species of birds. Those who may not actually perch or eat from the feeder will find the platform area with spilled seed very inviting. Which brings us to the spilled seed itself and the savings in money spent on that seed. So, it serves more than one purpose to add a seed tray to existing bird feeders, as it creates a clean feeding environment and attracts more feathered friends! Summer time is when migrating, tropical songbirds with vibrant colors head our way to North America. These gorgeous birds with sweet songs will grace your backyard if offerings are right. A birdbath is a must, as a fresh water source will attract more species any time of year. Most fruit bird feeders are versatile enough to use year round, by placing suet balls on them in winter. Nectar feeders, sans the lid may be filled with seed mixes, suet or mealworms in winter too. Some fruit feeders accommodate nectar and jelly, or nectar and fruit to entice a wider variety of birds. And Orioles aren’t the only birds who enjoy fruit. Woodpeckers are attracted to apples and melon, while hummingbirds covet their nectar feeders. You’ll also attract Catbirds, Flickers, Cactus Wrens and even Chickadees by having fruit or jelly feeders in your yard. Butterflies enjoy fruit as well, a bit over ripe-but definitely not moldy. Try bananas, oranges, berries and melon to entice butterflies too. Many of the new fruit bird feeders are made of recycled plastics, with a much longer lifespan, they’re guaranteed to never crack, split or fade. So, before summer passes you by, place one of these versatile feeders in the garden and see who comes around to visit! Part of the pleasure of feeding wild birds is the added esthetic it brings to your environment. Simply put, folks like to look at artistic, fun, fancy and whimsical things. Bird feeders are no exception, with every make and model imaginable! 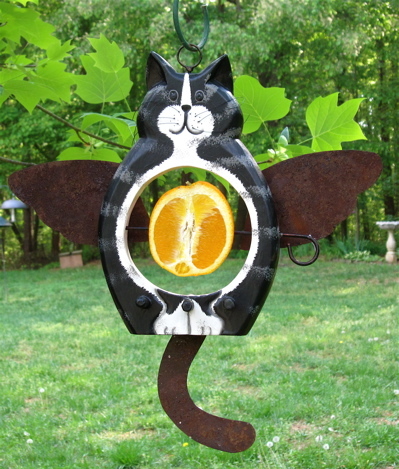 This fruit bird feeder is really a hoot, the Angel Cat he’s called. But more than fun, he’s a totally functional feeder for year round use. Maybe your resident birds don’t eat fruit in winter, but sure as day…they’ll eat suet when temperatures are freezing. And that’s the beauty of this fruit bird feeder-it can be used for suet balls in winter time. Change up fruit offerings and see who comes around. 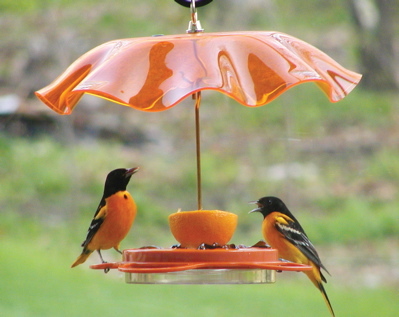 Orioles are a sure bet for orange halves, while apples and melon may attract woodpeckers. With a total of six perches, (3 in front-3 in back) there’s plenty of room for birds to stop and feed. And with the large rustic, movable wings and tail, birds may perch here as well, to rest a bit or wait their turn for some chow. Hand crafted of fast growth, renewable wood, the Angel Cat makes a great gift for any birding enthusiast, cat person, or nature lover on your gift list!